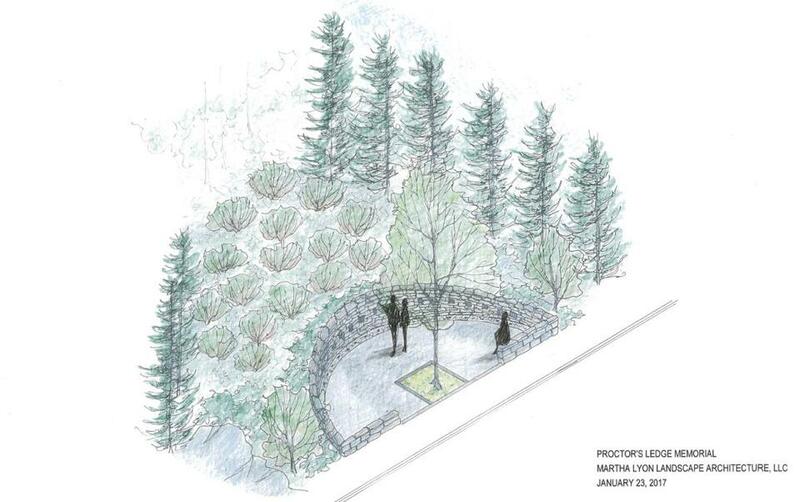 Salem officials released the final design for the Proctor’s Ledge memorial this week. Salem is adding a new attraction to its list of spooky spots. Officials in the region’s Halloween capital released this week the final renderings for a memorial at Proctor’s Ledge, a small plot of land surrounded by woods where researchers say 19 people accused of practicing witchcraft in 1692 were executed during the infamous Salem Witch Trials. “Having this site memorialized, especially as we prepared to mark the 325th anniversary of that tragic event, presents an opportunity for us to come together as a community, recognize the injustice perpetrated against those innocents in 1692, and recommit ourselves to the values of inclusivity and justice,” Salem Mayor Kim Driscoll said in a statement. Historians confirmed the area was the likely site of the witch hangings in January last year, after years of dedicated research aided by a professor from Salem State University. All 19 people who were executed by hanging during the witch trials are believed to have died at Proctor’s Ledge; five others died in jail, and one was crushed to death. The project will include a landscaped area at the base of Proctor’s Ledge, as well as the construction of a semi-circular stone wall along Pope Street. That’s where people will stand and gaze up at the site of the executions. The wall will bear the names of the witch trials victims, each one illuminated by lights in the ground, according to designs created by Martha Lyon Landscape Architecture. The design and construction of the memorial will be funded in part by a $174,000 Community Preservation Act grant, officials said. The city hopes to funnel additional funds from a portion of tickets sales at the “Witch House,” a popular tourist destination, for general upkeep at the site. Plans call for the completion of the project by spring or early summer, in time for a dedication ceremony to mark the 325th anniversary of the hangings. Steve Annear can be reached at steve.annear@globe.com. Follow him on Twitter @steveannear. Laura Crimaldi of the Globe staff contributed to this report.